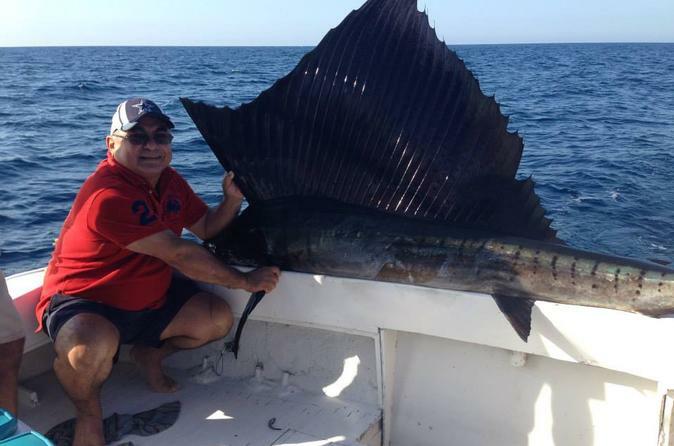 Experience the thrill of catching a sail fish or a marlin on Pacific Ocean waters; enjoy Acapulco's tropical scenery and bask in the glorious sun while you wait for the fish. Includes four chairs, six fishing lines, bait, fishing gear and round transfer to the pier. Food and Beverages are not included. Acapulco is located on a deep, semi-circular bay which is one of the most beautiful world wide and has been a port since the early colonial period of Mexico's history. It is a port of call for shipping and cruise lines running between Panama and San Francisco, California, United States. Acapulco is also Mexico's largest beach and resort city. Discover the magnificence that make Acapulco come into prominence in the 1950s as a getaway for Hollywood stars and millionaires. Acapulco is still famous and still attracts many tourists. The resort area is divided into two: The north end of the bay is the "traditional" area, where the famous in the mid-20th century vacationed; and the south end is dominated by newer luxury high-rise hotels. You'll be picked up from your hotel and taken to the pier to board your boat. You will enjoy sailing across the sea and admiring the wonderful views. You can bring your own food and drinks to enjoy while at sea. After a great time, you will be taken back to the pier to board a vehicle and be taken back to your hotel.